Now what’s on my design Wall? 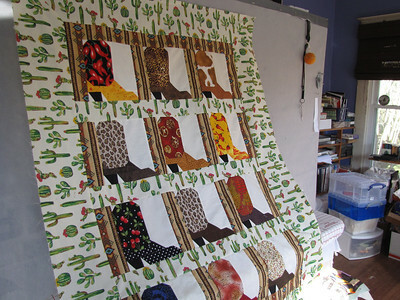 Somehow I was enticed by the cuteness value of these cowboy boot blocks and succumbed to only mild elbow bending to agree to make twelve of these. Unfortunately for me, there was a bit of paper piecing involved in the sole part of the boot—-and those close to me know that I do not do paper piecing despite the many methods AND I do not cut things very accurately. However, I think this little quilt which will most likely be destined for Boys Haven turned out rather nice. And another one to add to the stack of ‘to be quilted’.